I had a pretty good run this morning with my TNT group! I ran/walked a little over 4 miles. The first mile was fairly easy, so that's a good sign! 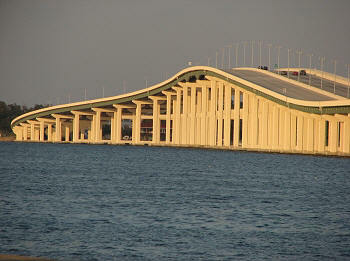 Then, we went up the Ocean Springs/Biloxi Bridge and that part was TOUGH. I wish I had taken this picture! So, overall, I feel good about the run and I'm looking forward to 5 miles next Saturday. I will say that I like running out and back better than a loop. 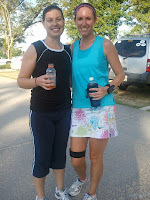 I'm not sure if it's all in my mind or what, but today's run felt shorter than Wednesday's (and it was only 3 miles!). Do you like to run out and back or do a loop/repeated loop?